The Catalan Centre of Toronto is a meeting point for the Catalan-Speaking people of Toronto and Ontario and the sympathizers with the culture of the Catalan Countries. At the same time we want to contribute to the promotion of the language, history, and culture from the Catalan Countries. The Crosstown Community Relations team works with a variety of stakeholders such as residents, businesses, BIAs (Business Improvement Areas), community organizations, religious institutions, and schools along Eglinton Avenue to identify and respond to issues and find ways to mitigate against construction impacts. 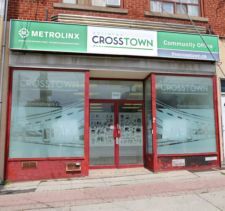 The Crosstown team participates in various activities throughout the year to increase awareness of the Eglinton LRT, provide relevant project updates, and to support the marketing efforts of BIAs and local businesses. Muslim mosque offering daily prayer, and Arabic, Quran, and Hadith classes for youth and adults. The primary focus of Al Qalam Islamic Community Centre (AICC) is to advance the teachings of the Islamic faith and the Arabic language through the provision of religious services and education to the community. Al Qalam strives to foster a positive understanding of Islam and invites people to the way of Allah with wisdom and beautiful preaching. 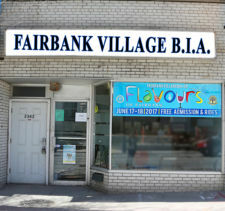 The Fairbank Village Business Improvement Area office. Private members only social club for veterans. Upstairs hall is available for rental the venue accommodates approximately 100 people. “Helping people to make a new beginning”. The Universal Church is committed to guiding you to discover your potential, to live a full and happy life, and to connect to God directly. You will also find practical help and guidance through their support activities. Walk into any UCKG and you can expect a warm welcome by people who genuinely care about you and who will be with you every step of the way to your new life. Services are offered in English, Portuguese and Spanish.